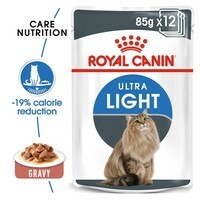 Royal Canin Ultra Light Care Pouches in Gravy Adult Cat Food is a complete and balanced wet diet for adult cats aged from 1 to 7 years old, to help them limit weight gain. Made with thin tender chunks of meat in a savoury gravy, Royal Canin Ultra Light contains high levels of L-carnitine to help the body utilise fat stores more efficiently, and is rich in a special blend of fibres to help your cat feel fuller for longer. Crude Ash: 1.4%. Crude Fibre: 1.2%. Crude Oil Fats: 2%. Moisture: 82.5%. Protein: 11%.